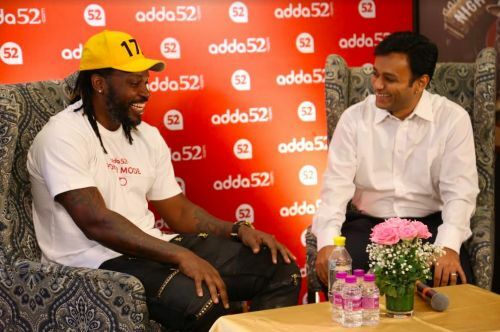 Mumbai, 25th October 2018: Adda52, India’s leading online poker website organized 'Poker Nights with Gayle', an exclusive Diwali extravaganza on 24th October at Mayfair Banquet in Mumbai. Adda52 is a pioneer in online poker in India and provides a safe and secure platform for the poker lovers owing to its award-winning technology. The portal is aimed at providing an enjoyable gaming experience to its diverse set of users along with enhancing their aptitude and analytical skills, by the virtue of the game that it is. According to the All India Gaming Federation, skill-based gaming is the future of the online gaming industry in India. Out of the total $200 million grand value of the gaming industry, approximately $70 million is based on real money gaming and the rest $130 million is for the casual gaming sector. And Adda52 intends to invest aggressively to maintain its leadership position in this huge market space without compromising on its value and quality standards. The event 'Poker Nights with Gayle' is an ode to the customary Indian Diwali celebration and an effort to bring people together to have fun. Poker is a great fitment to the occasion as it captures the spirit of Diwali.